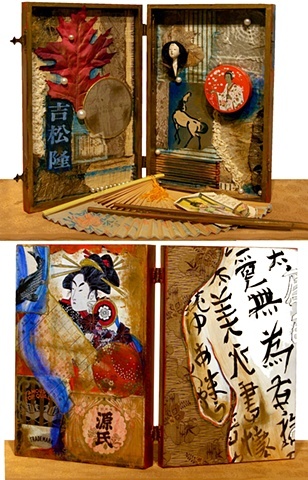 Mixed media on all 4 sides of a hinged box. Inside, lies an antique Japanese doll head, along with other Oriental symbols and memories. On the reverse side, the bare back of a geisha inscribed with Japanese characters (please do not ask for a translation), and an image of an old geisha's face, and more . Enjoy looking.